An unseen problem within an application poses significant risk to the security, reliability, and performance of pertinent systems, as well as the entire infrastructure of an organization. Is a substantial amount of your IT budget consistently dedicated to the resolution of problems caused by undetected system vulnerabilities? If so, an application intelligence platform dedicated to identifying these issues early on is a viable solution for resolving detrimental, costly, and unknown risks. Why is IT Risk Management Imperative to Organizations? While these problems account for a small fraction of software vulnerabilities, they average approximately 52% in repair efforts for most organizations. IT risk management is the process of managing potential or existing issues to lower business risk during the use, ownership, operation, and adoption of new technologies. The implementation of systems and utilized applications on a multi-tiered infrastructure for managing several diversified locations increases the complexity of each piece of software that is developed and implemented within an infrastructure. IT risk management involves the identification of application or system issues to lessen or eliminate the impact of undetected problems on business processes. What Are The Benefits of Identifying Potential Threats? The ability to identify potential problems before they occur ensures minimal business disruptions. A proper solution for analyzing critical systems makes it easier to support business planning, decrease IT costs, and utilize resources more efficiently. Eliminate Potential Threats Before They Make Themselves Known! 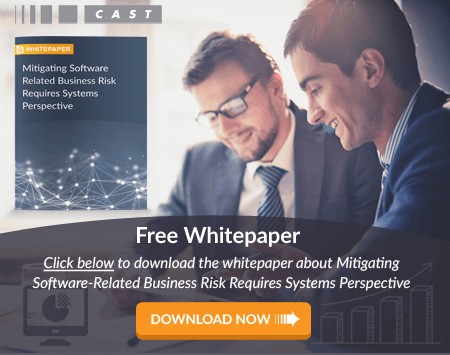 CAST offers an IT risk management platform that detects unknown application vulnerabilities to decrease costs and the occurrence of business disruptions. Our AIP (Application Intelligence Platform) is an option for attaining extensive insight to the potential vulnerabilities accompanying software development or package upgrades across a large, multi-tiered infrastructure. Contact us today to see how a system level analysis solution can help your company gain the upper hand on potential problems through improved IT risk management. Take a look at the type of risk insight you can gain today.